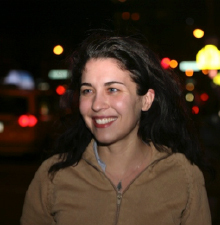 Olivia Newman has written, directed and produced award-winning short films in the United States, France and Serbia. Olivia’s films have received awards from HBO, The Caucus for Producers, Writers and Directors, SimonSays Entertainment, Cine Golden Eagle and the Angelus Awards, and have screened in film festivals internationally, including the New York Film Festival, Aspen Shortsfest, Palm Springs International Shortsfest, Cinequest, Lunafest, Vancouver International Film Festival and the Bermuda Film Festival. Her short film First Match won Best Student Short at the 2012 Aspen Shortsfest, Best Short Film at the 2012 New Jersey International Film Festival and is currently airing on PBS in the United States. Olivia is a 2012 Film Society of Lincoln Center/IFP Emerging Visions Fellow for the development of her first feature film. She received her M.F.A. in Film from Columbia University and was awarded faculty honors for her original screenplay 216 Garden Street. First Match — In First Match, a coming-of-age drama set in central Brooklyn, a teenage, foster care girl decides to join the all-boys high school wrestling team in order to win the affection of her estranged father who has recently returned from prison.